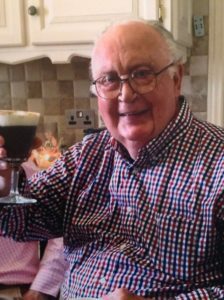 John (Jack) Cawley, 81, passed away peacefully after his 8 month battle with cancer, while surrounded by his family on July 20th, in his home in East Norriton. Jack is predeceased by his parents, John and Helen Cawley. He is survived by his beloved wife Barbara and his children; Chris (Joanne), Barbara FitzPatrick (Kevin), and John (JoAnn). He is survived by his nine grandchildren, his pride and joy; Chris, Joe, Tim, Liam, Caitlin, Thomas, Jake, Emma, and Johnny. He is also survived by numerous nieces, nephews, extended family, and friends. Jack was born in Bronx, NY and moved to Germantown with his parents while he was just a boy. He attended North Catholic where he met the love of his life, Barbara Cerino. He graduated in 1954 and shortly after joined the United States Air Force. They were married in 1961 and he was activated during the Cuban Crisis and was honorably discharged as a Master Sergeant in 1964. Jack and Barbara settled in Chestnut Hill where they raised their three children. He took a position at the Federal Reserve Bank where he retired after 34 years. He started out counting pennies and moved his way up to Senior Bank Auditor. After retiring, he switched gears and took up his real passion of working with his hands. He helped his children, family, and friends with numerous projects from pictures frames to full kitchens. If you needed something done you knew you could count on Jack. The Cawley family moved to Wyndmoor in 1986 and joined Seven Dolors Parish; Jack continued to participate in his much cherished Men of Malvern Retreats. Jack was a lifetime member of the Chestnut Hill Bocce Club and served as a Post Commander of the Wyndmoor American Legion. He continuously listened to his favorite Caruso and Pavarotti songs along with an occasional Irish Ballad mixed in while sipping a Guinness. He cherished the opportunity he had to visit Ireland in 2016 where he was graciously greeted by numerous cousins and relatives. He was a master of the Irish Good-bye and practiced it at most family gatherings. Visitation will be in the Narthex of Saint Helena Church, Blue Bell on Tuesday, July 25th beginning at 9:30 AM. His mass of Christian Burial will follow in the Church at 11:00 AM.